I was asked a while ago by a train model maker if I could make a War Memorial for his train layout. I loved the idea and in the end I made a memorial in four scales. As well as being a model that can fit onto a train layout, I think it would also make a great piece of street furniture for wargames and tabletop adventures! As you can see from the image above, each scale is slightly different. I put in as much detail as I can for each scale. I have also made just the plinth available to be printed so that you can add your own statue on the top! 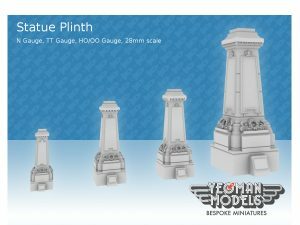 The Plinths are also in N Gauge, TT Gauge, HO/OO Gauge and 28/32mm scale. 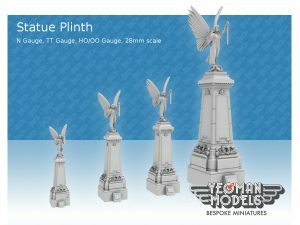 I liked the Angel on top of the largest plinth and so she is on Shapeways as her own 32mm miniature figure! Unlike the Angel on the plinth though, her sword is not pointing downward but is in fact pointing upward ready to fight!